Cruises run all through the year, with ever-changing calendars and schedules for each line and ship, so there are always new things to look forward to and new voyages to start preparing for. Whether you’re looking to enjoy some time on a beautiful island paradise in the Caribbean Sea or head off on a journey along the coastlines of North America, South America, Europe, Asia, or somewhere else altogether, major cruise lines like Carnival, Royal Caribbean, Holland America Line, and Norwegian Cruise Line are waiting to bring your fantasies to life. 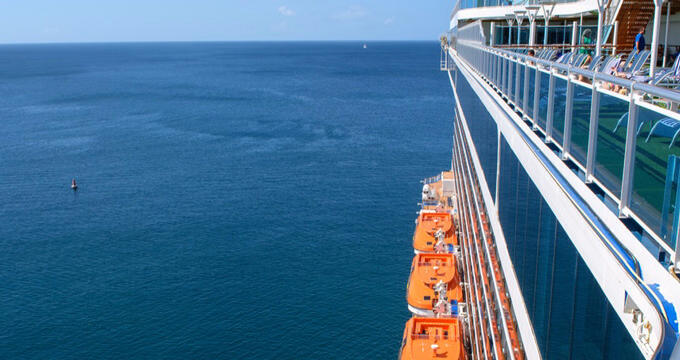 December is a particularly good month to take a cruise. Everyone associates December with Christmas, and it’s also a month that is quite cold and frosty for many parts of the world, especially around the United States, so it’s a good time to just get away from it all. Don’t let all that cold weather get you down; choose a cruise to enjoy an amazing adventure with your friends and family. You could even choose a Christmas cruise in order to celebrate the holidays at sea or at an amazing island destination, soaking up the sun and splashing around in warm, turquoise waters, rather than staying home and trying to get warm. Read on for some of the best December cruises you can take. A hugely popular cruise all through the year, the '3 Night Bahamas' cruise from Carnival also runs on multiple dates in December, letting you enjoy this cruise as the year comes to a close. It's a great option as a Christmas or New Year celebration cruise, as well as simply offering a fun weekend getaway opportunity for people of all ages at an excellent price. For this cruise, you'll have the pleasure of traveling on board the beautiful Carnival Conquest. The leading ship in the Conquest class, the Carnival Conquest is over 950 feet long and has a crew of over 1,100. It features gorgeous staterooms and deluxe suites with wonderful furnishings, along with lots of on-board amenities and features for the comfort and convenience of all guests. You'll find multiple shops, games, clubs, activities, and shows on board, as well as plenty of good eateries and bars like Guy's Burger Joint and the Red Frog Rum Bar. This December cruise runs for just three nights and sets off from Miami, Florida, calling at one location only: Nassau. Nassau is the capital city of the Bahamas and one of the best places to visit in the whole Caribbean for its cuisine, culture, beaches, sunny weather, and more. It's a super city with a lot to offer, so no matter what sort of activities you enjoy, you're bound to have a great time on this Caribbean cruise. When the cold winter nights of December start creeping in, one of the best things you can do is book a spot on board the Carnival Imagination for this excellent '4 Night Catalina & Baja Mexico' cruise out of California down to Mexico. It's a great option and highly affordable too, with super low room and suite prices available to those who book in advance. You'll be traveling on the Carnival Imagination for this cruise. A well-appointed ship with a lot of fun features and useful amenities, the Imagination really stands out in terms of food, drink, and service. You'll find some great bars on board like the Red Frog Rum Bar and Sky Box Sports Bar, along with several super eateries ranging from casual burgers, tacos, and pizzas to more refined, speciality fare. For this December cruise, you'll be heading out of Long Beach, one of the two major cruise ports for Los Angeles, and making two stops. The first stop will be at Avalon on Catalina Island. There, you can visit locations like Moonstone Beach and the Wrigley Botanical Garden, admiring the stunning scenery not too far off the coast of LA. Next, you'll head south of the border for a stop off at Ensenada, Mexico. In this gorgeous port resort city, you can relax and forget about your troubles at the Bahia San Luis Gonzaga, visit the fascinating Riviera of Ensenada museum, or even check out a local winery or some live entertainment at various venues and parks around the local area. In December, most of the United States is quite cold and frosty, with lots of snow falling in the northern states in particular, but there's one magical US island location that sees a lot of sunshine and warm weather all through the year: Hawaii. That's why this '7 Night Hawaii' cruise is a great way to get away from it all when December comes along, and it can be a super cruise for people looking to celebrate Christmas or New Year in style too. For this Norwegian Cruise Line cruise, you and your fellow passengers will be able to travel on the excellent Pride of America. A stunning ship measuring up at over 920 feet in length and fully refurbished back in 2016, the Pride of America features over 15 separate restaurants and more than a dozen bars and lounges too. It also offers spacious, comfortable, nicely-decorated and furnished accommodation options, and much, much more, with the whole ship being designed and laid out to make your journey as enjoyable, exciting, and varied as possible, with new things to be discovered each and every day and night. This '7 Night Hawaii' December cruise sets off from the capital city of Hawaii: Honolulu on O'ahu Island. From there, you'll head over to Maui Island for an exploration of the Kahului area, where you can visit the Maui Nui Botanical Gardens and Kanaha Beach Park. Next, you'll head over to the Big Island and stop off at Hilo and Kailua Kona for more samples of Hawaiian island life. You'll then get to enjoy a cruise across to Nawiliwili on Kauai and a journey along the Napali Coast of Kauai, home to some of the most awe-inspiring scenery anywhere in the Aloha State.